Boil the cauliflower, zucchini, broccoli stem and garlic in the bone broth (or water) until soft and cooked through. When it’s ready, add the cooked veggies to a food processor or thermomix and blend with 3 Tbsp butter/ ghee until smooth and creamy. Taste the mixture and add salt if needed. If the sauce is too thick add in a little more bone broth and re-blend until you reach your desired consistency. If you want the sauce to be ‘greener’ in colour, blend through some spinach leaves now until super smooth and creamy (this is optional). Heat a large frying pan with butter or ghee. Fry off the onion until golden brown. Pat the bacon dry using a paper towel and slice it into 5cm cubes. Push the onions to one side of the pan and cook the bacon until crispy and golden brown. Add the finely diced garlic, mustard seeds (this is optional) and pepper and stir it through the bacon and onions and cook for a few more minutes. Meanwhile, add water to a saucepan and bring it to the boil. Remove the onions, bacon and garlic from the pan and set it aside. Now to cook the chicken. Pat the chicken dry using a paper towel. Place the chicken skin side down in the hot pan with the leftover bacon fat. Add the rice noodles to the boiling water and cook for 4 minutes in the boiling water. Then add in the zucchini noodles (zoodles) and cook for a further 2 minutes. Taste the rice noodles to see if they’re al dente. If they’re ready, pour them into a strainer/ colander. Turn the chicken over and cook on the other side. When the chicken is evenly cooked, remove it from the pan and rest for 5 minutes. Slice into squares. 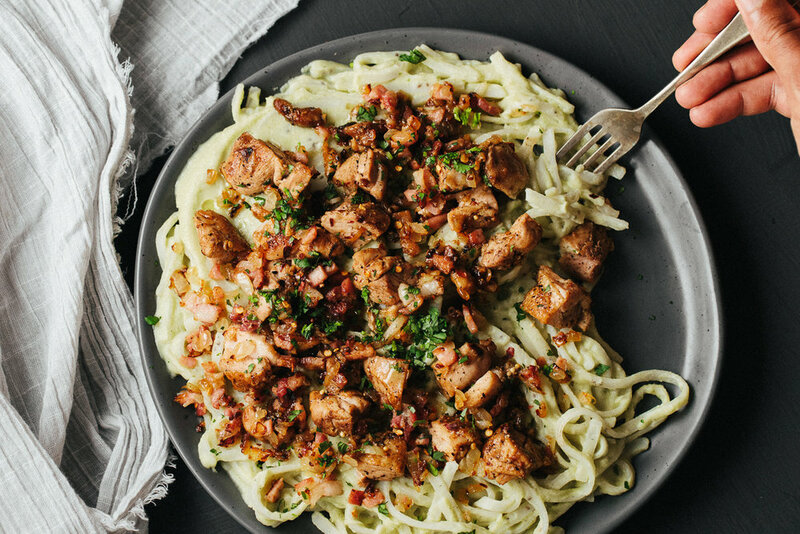 Add the cooked noodles and zoodles, carbonara sauce, bacon and onion mix and the chicken to a large bowl and toss gently to combine evenly. Serve in bowls and garnish with some freshly chopped parsley and salt and pepper to taste. For similar recipes, please check out my Creamy Basil & Prawn Alfredo Noodle dish.